"It was in the cold and bleak days of February, 1885,..."
"This scrapbook is priceless in that it tells the story of the skills of the early days printing industry, the ingenuity of artists, the almost unbelievable artistry of lithographers of the 1800s and the genius of script writers." Find A Grave, database and images (https://www.findagrave.com : accessed 25 January 2019), memorial page for Earl Arnold (12 Nov 1845–6 Feb 1885), Find A Grave Memorial no. 75708807, citing West Cemetery, Bristol, Hartford County, Connecticut, USA ; Maintained by C. Greer (contributor 47180683) . "From the front lines he was given the lighter duties of assisting in the stable of President Lincoln in Washington DC. Returning, he was sent to Speculator, hoping the pine-covered areas would stay his affliction. "Arnold had been one of four children, who when their mother died at the age of 36, were separated and taken into the homes of relatives and friends. 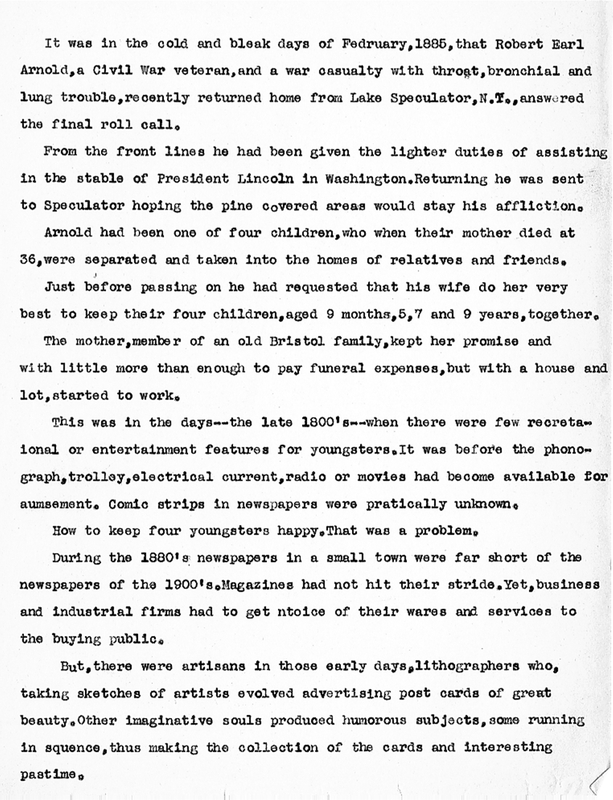 "Just before passing on, he had requested that his wife [Emma Jane (Bailey) Arnold] do her very best to keep her four children, aged 9 months, 5, 7 and 9 years, together. "The mother, member of an old Bristol family, kept her promise and with little more than to pay funeral expenses, but with a house and lot, started to work. "This was in the days--the late 1800's--when there were few recreation or entertainment features for youngsters. It was before the phonograph, trolley, electrical current, radio or movies had become available for amusement. Comic strips in newspapers were practically unknown. "How to keep four youngsters happy. That was a problem. 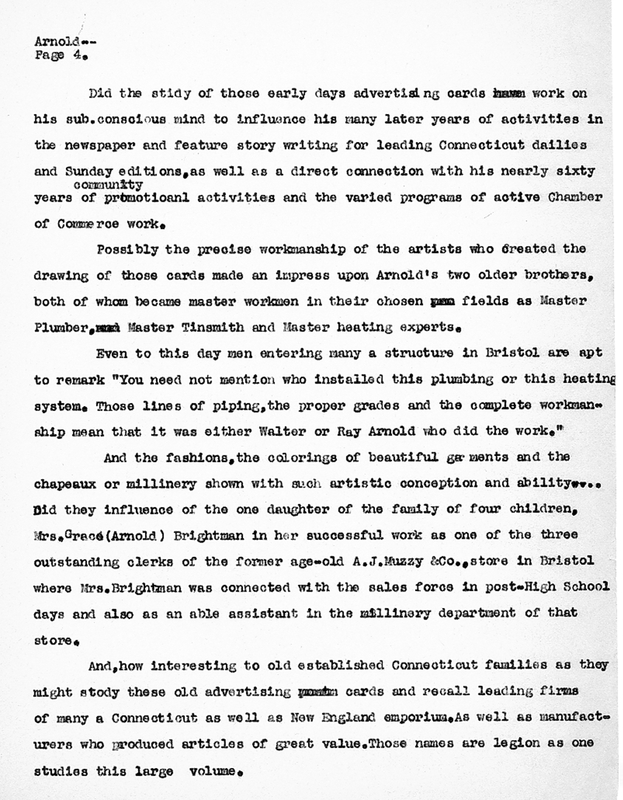 "During the 1800's newspapers in small towns were far short of the newspapers of the 1900's. Magazines had not yet hit their stride. Yet, business and industrial firms had to get notice of their wares and services to the buying public. "But, there were artisans in those early days, lithographers who, taking sketches of artists evolved advertising post cards of great beauty. Other imaginative souls produced humorous subjects, some running in sequence, thus making the collection of the cards an interesting pastime." These advertising post cards were produced in a wide variety of subjects, colors and combinations and ran from the small type as used by cigarette manufacturers to the more acceptable form of approximately the size of the government post card. Then on to the more pretentious 5 by 7 and the 7 by 9 inch cards, these latter generally carrying posed portraits of celebrities, particularly those in the opera field or prominent government officials. Bulk US Postal mailings were not available in those early days and thus the advertiser sought distribution through various mediums. One was the passing out of cards at country and agricultural fairs. It was in this era that Mother Arnold thought of an entertainment program for her four small children. 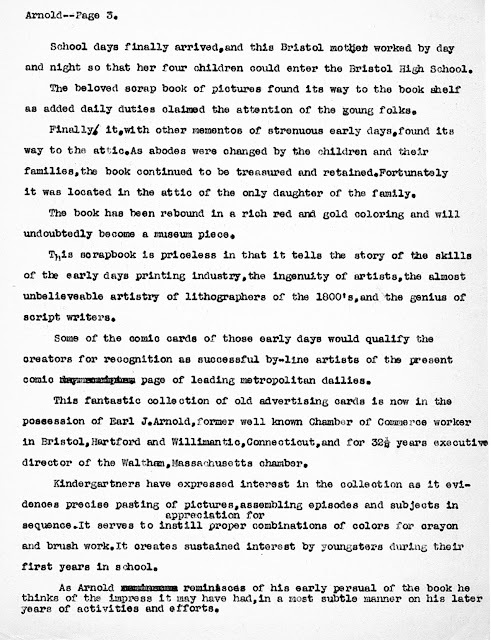 She amassed a large collection of these advertising cards and pasted them in methodical form in a large scrapbook. Encased in a hard-bound scrapbook, the mother found that her children were entranced with the pictures and colorful artistry and they would spend many quiet hours going from page to page. This scrapbook was used for years. 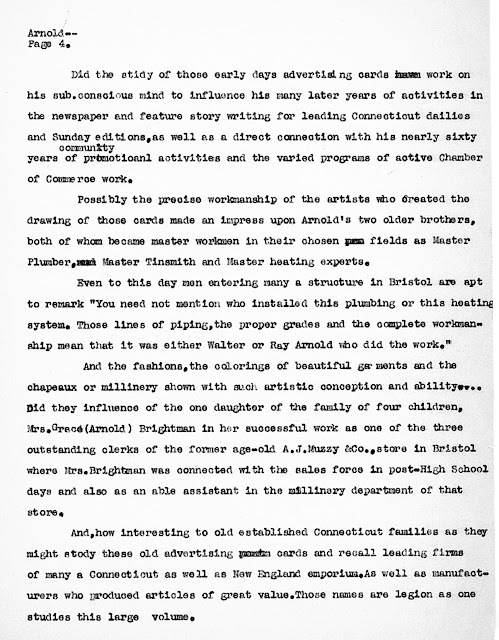 Her children coming in from play periods out-of-doors or from their duties caring to the family garden or from collecting and delivering the family washings the mother did for neighbors to keep the family together,--found restful enjoyment. So, the years rolled by. 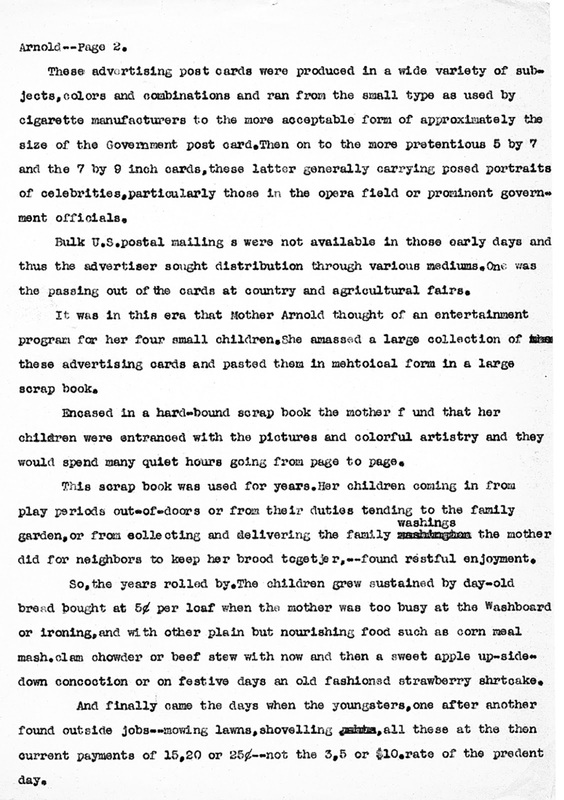 The children grew, sustained by day-old bread Bought ad 5 cents per loaf when the mother was too busy at the Washboard or ironing, and with other plain but nourishing food such as corn meal mash, clam chowder or beef stew with now and then a sweet apple upside down concoction or on festive days an old-fashioned strawberry shortcake. And finally came the day when the youngsters, one after the other, found outside jobs mowing lawns, shoveling, all these at the then current rates of 15, 20 or 25 cents, not the $3, 5 or $10 rate of the present day. I thought there was one interesting little detail about Earl Arnold's early employment missing from the above, which is noted below for those who have not read the article on page xiv already. There is also a public record on Ancestry.com If you are not already a member, you may have to sign up for a free account to see it.